We all know that Taco Bell isn’t Mexican food. I don’t think anyone who eats at Taco Bell wants it to be Mexican food, they want it to coat their stomachs in a hurl-resistant grease coating to keep your favorite bar’s well swill from revisiting your mouth on its way to the sewer system. Or at least that’s the reason I would go to Taco Bell, which makes their addition of breakfast items suspect to me. Who’s going out and getting hammered first thing in the morning? It’s really more of a hazy buzz time of day, which is why mimosas and brunch exist. 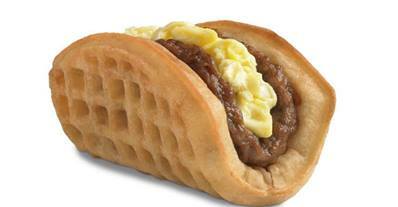 So anyway, now there’s going to be a waffle taco at Taco Bell: a waffle stuffed with scrambled eggs, cheese, and a sausage patty (or bacon), served with syrup. Other than the shape, I don’t really see what makes this taco-like–you could assemble your own waffle taco at literally any breakfast place. So I guess the wild card here is that it’s from Taco Bell. Can you start your day off with Taco Bell? Should you start your day off with Taco Bell? Will you start your day off with Taco Bell? These are the important questions. Pros: All the breakfast foods you love in convenient handheld form. Cons: Rolling the dice on birthing a toilet-shattering abomination later in the day because you ate at Taco Bell. Somehow even less Mexican than regular Taco Bell food–put some chiles in the eggs or the cheese or make it a cumin-flavored waffle or something! If you’re one of those weirdos who doesn’t like the food on their plate to touch, this one is going to be a problem for you. Would you eat a Taco Bell Waffle Taco? Yeah, I don’t understand why they only went the sweet route when this lends itself to savory and spicy so well. I would be more inclined to eat the hell out of this if it brought ANYTHING new or taco-related to the table.